Bluetooth technology is a wireless connectivity feature that has a short range and low power consumption. Using your device's Bluetooth transmitter, you can connect to a wireless headset and entertainment devices like wireless speakers. You can also connect to many car infotainment systems and share your device’s music. You can share content, such as pictures and contact cards, between two devices. Note : Bluetooth communication range is approximately 30 feet. 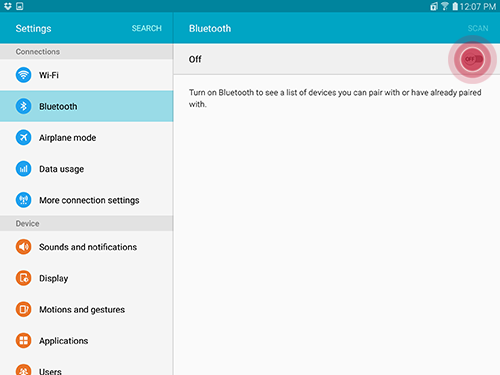 To connect with a Bluetooth device, Bluetooth must first be turned ON and make sure it is in discoverable mode or visible. 1. From a Home screen, touch Apps > Settings > Bluetooth . 2. Touch the slider to turn Bluetooth . 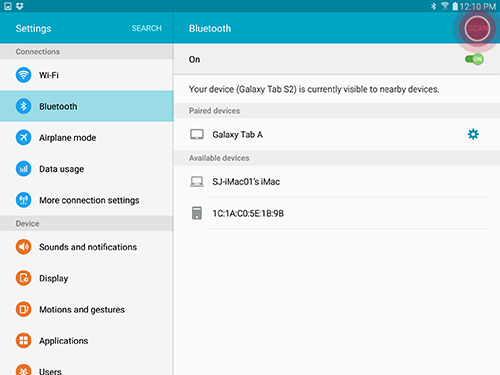 Note : You can also turn ON your device's Bluetooth transmitter using the Quick Panel shortcut. 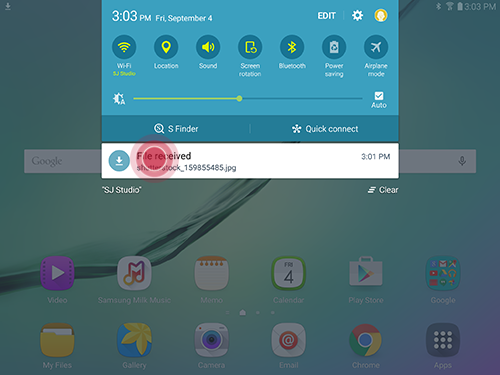 Open the Notification Panel by swiping from the top of the screen to the bottom, and then touch the Bluetooth icon . When Bluetooth is ON, the icon will appear green . 3. 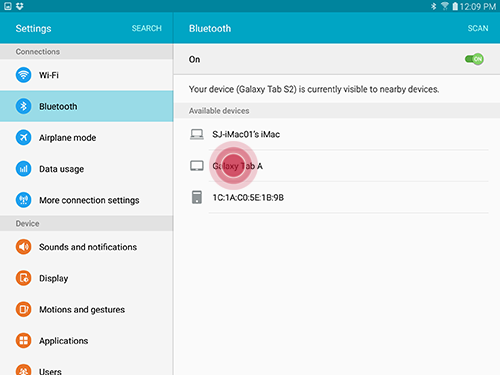 Your device will scan and display available nearby Bluetooth devices. Touch the name of the device you want to connect to. 4. When prompted, verify passkey matches on both devices and touch OK to pair devices. 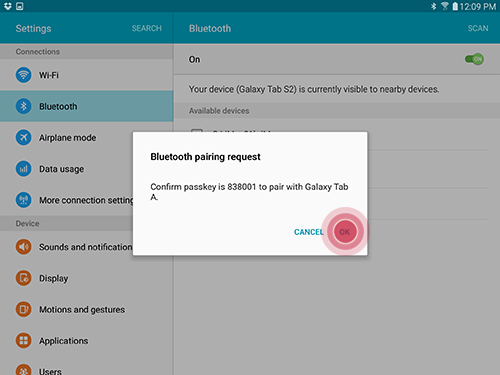 Note : If you are connecting to an older Bluetooth device, you may be asked for a PIN. The default PIN for many devices is four zeros—0000. Some devices have PINs specific to the device. The PIN will be in the device’s documentation. 5. 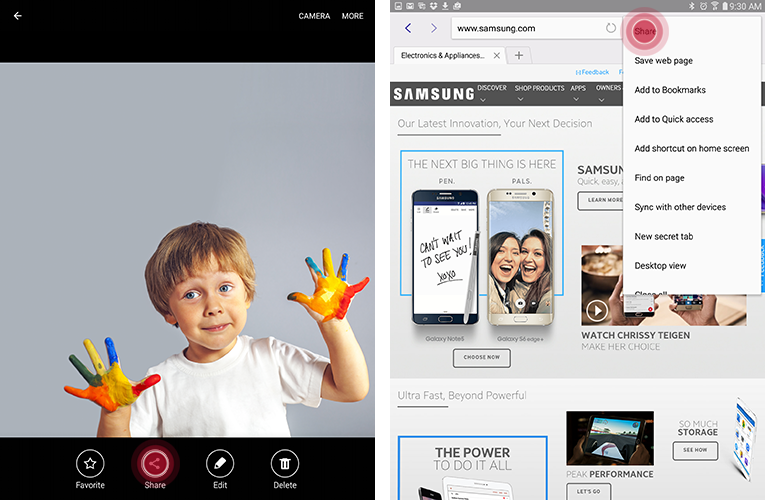 Touch SCAN to refresh the available device list to search for more available devices nearby. Many of the applications on your device let you share content via Bluetooth technology. 1. 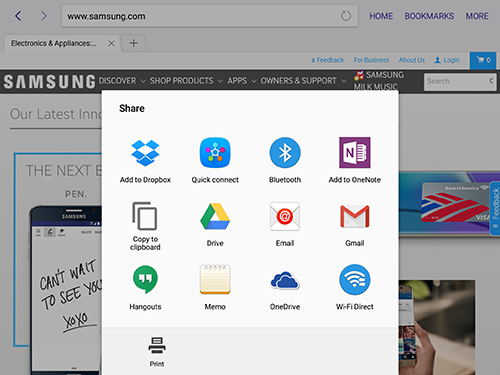 When using applications like the Gallery and Internet, touch Share via or MORE options and select Share or Share via. 2. 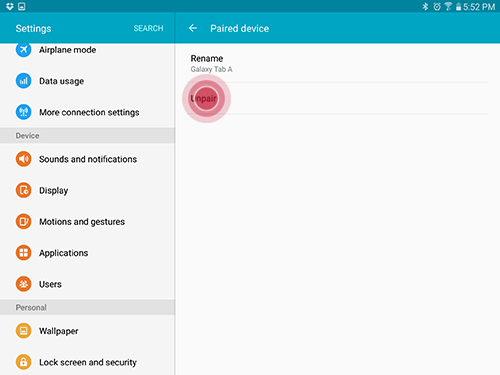 From the available list, touch Bluetooth and select a device to share with. 3. The other device will need to accept the transfer request. 1. 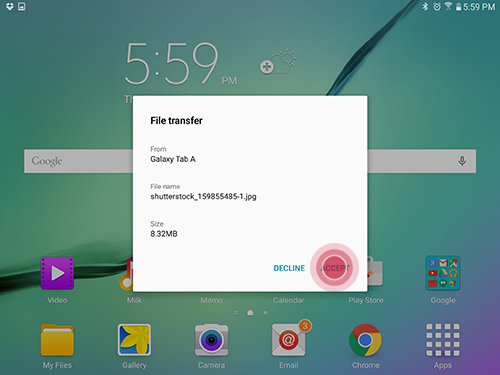 When another device sends content to your device, you will see a File transfer request letting you know the device’s Bluetooth name. Touch ACCEPT to proceed file transfer or DECLINE to stop connection. 2. If you accepted the File transfer, the content will be downloaded from the sender and stored in Apps > My Files > Device storage > Download . 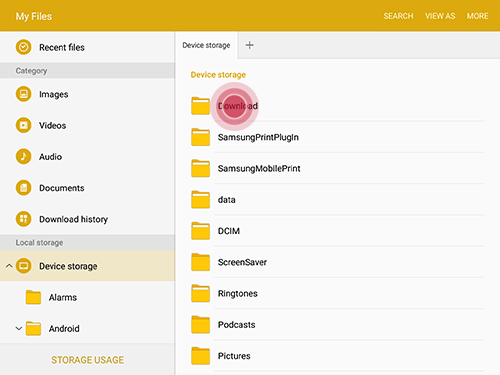 Note : You can also see the transferred files by opening the Notification Panel (swipe down with finger from the top of the screen) and touching File Received. 1. 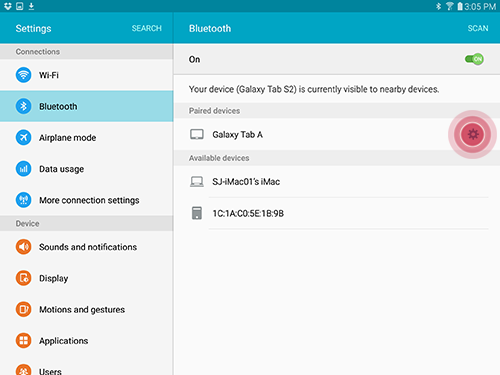 To unpair a device you have connected to, from the Home screen, touch Apps > Settings > Bluetooth . 2. Touch the Settings icon next to the name of the device in the Paired devices list. 3. Touch Unpair to finish unpairing.